The heart of your engagement ring is the main stone. It is what the entire ring is based around. We are here to help you choose from the different options that are available to you when customizing your engagement ring. Choose from the traditional choice of a diamond or a non-traditional choice of a gemstone or an affordable one of a diamond alternative. Our unique main stone shopping experience makes it easy to search and compare main stone options in realtime. Below you will find more information on each of the popular main stone options that you can shop on our website. You must be familiar with the phrase. "A Diamond is Forever". Diamonds have been a symbol of love and commitment; known for its rarity, sparkle, durability and hold of value. When you think about engagement rings, the first stone that comes to mind is probably a diamond. That's because diamonds have long been associated with engagement rings and romance. However, diamonds are not just popular because of marketing campaigns. Instead, they are desirable stones for countless important reasons. Diamonds are a hard stone, which means they are incredibly durable. Diamonds are permanent, and the concept of permanent romance is what drives many proposals and weddings. Diamonds also do a fantastic job of retaining their value, making them a smart investment for buyers. Finally, diamonds are spectacular. Their appearance is perhaps the number one reason to buy a diamond engagement ring. Their sparkle, brilliance and beauty are often considered to be unmatched. The very first diamond engagement ring was given to Mary of Burgundy in the 15th century by the Archduke Maximillian of Austria. This led to the practice of exchanging diamond engagement rings, but it was still a concept exclusively for the nobility. By the 20th century, diamonds became the traditional choice for engagement rings. The phrase, "A diamond is forever," encouraged couples to mark their commitment through diamonds. Among those who buy engagement rings, the majority of people will purchase a ring featuring a diamond. Although there are plenty of excellent alternatives, diamonds still hold a special place in the hearts of many couples. Some of the most iconic engagement rings in the world featured diamonds, and celebrities like Paris Hilton, Meghan Markle and Kim Kardashian West all wear diamond engagement rings. When it comes to choosing the diamond for your engagement ring, you'll have lots of decisions to make. Buyers might need to consider budget, carat size, clarity and color along with the shape and cut of the diamond itself. However, one decision not to overlook is whether to choose a natural mined diamond or a lab grown diamond. A natural mined diamond, as the name suggests, is one that was mined underground. While it is cut and polished like all commercial diamonds, a natural mined diamond is otherwise unaltered. You can find colorless as well as fancy colored diamonds depending on your preferences and your budget. Fancy colored natural mined diamonds are very rare, with fewer than 0.1% of all diamonds being colored. The scarcity of fancy colored diamonds in shades like yellow, pink, purple, green and blue means that the price is also higher than for colorless diamonds. That's what makes them so appealing to celebrities like Paris Hilton, who wore a yellow diamond engagement ring, or Jennifer Lopez, who received a pink diamond engagement ring from Ben Affleck. Lab grown diamonds are chemically identical to mined diamonds, but there is one big difference: These diamonds are manufactured in a laboratory setting. In some cases, carbon is crushed at high pressures to recreate the natural way diamonds are created. In other cases, layers of carbon are layered on top of each other to create a synthetic diamond. Lab grown diamonds are appealing to many since they offer a green footprint, are conflict free and are environmentally responsible. Celebs like Leonardo DiCaprio have invested in lab-made diamond companies because of their eco-friendliness. Lab grown diamonds, just like natural mined diamonds, are also available in colorless or fancy colored varieties. Fancy colored lab grown diamonds are created by adding trace elements during the growth process, making everything from pink diamonds and blue diamonds more accessible to millennial buyers. It might be said that diamonds are a girl's best friend, but there are plenty of precious gemstones that can be just as appealing. Not everyone wants to have a standard diamond or diamond alternative, but gemstones can shake this up and set you apart. 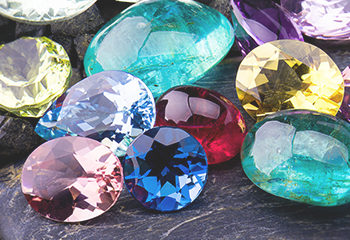 While not all gemstones are affordable, some can be cheaper than a traditional diamond. This is an added bonus for many shoppers. Whether you are looking for a stunning dash of color, you like to be unique or you just want to replicate one of the many celebrity gemstone looks, there are a range of gemstones that look fantastic in an engagement ring. Sapphires are one of the hardest stones on the planet, making them a durable choice for an engagement ring you can wear for a lifetime. Sapphires are traditionally thought of as blue, and a blue sapphire can be spectacular. However, there are also white, peach, pink, green and yellow sapphires, offering you plenty of choices for your ring. Sapphire is ideal for those who want a vintage feel for their ring. Kate Middleton received a blue sapphire engagement ring from Price William, and the ring once belonged to Princess Diana. If sapphires are good enough for British royalty, they are certainly good enough for a stunning engagement ring of your own. When celebrities like Eva Longoria want engagement rings with color and brilliance, they skip over diamonds and look for precious gemstones like rubies. Longoria's engagement ring from fiancé José Antonio Bastón boasts a large ruby as the center stone. With a blood-red color, rubies are a bold but unique choice for the right wearer. Since they are very hard and durable as well as rare, rubies aren't necessarily cheaper than diamonds. In fact, the rare Burmese rubies can often be far more expensive than diamonds. Just like when you're shopping for diamonds, shopping for rubies need to involve the four Cs: Color, clarity, cut and carat weight. Emeralds are another of the most precious gemstones on the planet. The bold green color is rich and luxurious, and it looks beautiful set in gold, silver or platinum, among other metals. Using an emerald as your main stone in an engagement ring can impart a vintage feel, but rest assured that plenty of modern rings feature the verdant gemstone. Perhaps the most famous emerald engagement ring of all time was worn by style icon Jackie Kennedy after John F. Kennedy proposed to her in 1953. Other more recent emerald engagement rings have been worn by everyone from Olivia Wilde to Halle Berry. One of the most underrated gemstones in the jewelry world is morganite. At first glance, morganite gemstones look like pale pink diamonds. The shade is feminine and undeniably romantic, making it ideal for something as special as an engagement ring. Morganite belongs to the same beryl family of gemstones that contains emeralds and aquamarine, so it is also hardy and durable. With the color of the decade being millennial pink, it makes perfect sense to see a resurgence in the use of morganite for engagement rings. Most importantly for those on a budget, morganite is significantly less expensive than using a main diamond in an engagement ring. Moissanite has a lot in common with diamonds. 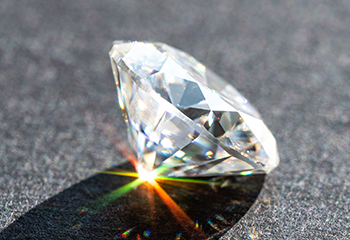 In terms of durability, moissanite has a number of characteristics that are quite similar to the durability of a diamond. That's one reason that it can be a viable alternative to a diamond. Moissanite also delivers sparkle and brilliance, it can serve as a comparable alternative. Another reason for the growing popularity of moissanite is that the stone is eco-friendly. Moissanite is created in a laboratory, meaning that there is a minimal environmental impact. One way to think about moissanite is that it delivers the illusion of a diamond. Of all the reasons to consider moissanite as the main stone for an engagement ring, the price is probably the most important. Many buyers are happy to make an investment in a diamond, but some shoppers would prefer to limit their costs as much as possible. While a single carat diamond is going to be thousands of dollars, the same size moissanite will be hundreds of dollars. This makes it a popular choice as a starter stone for an engagement ring. Color is one of the biggest differentiators. Using the traditional color grading system for diamonds, most moissanite stones come in the categories of colorless or near colorless. Just like with diamonds, colorless moissanite is the most expensive, while stones graded as near colorless are the least expensive. 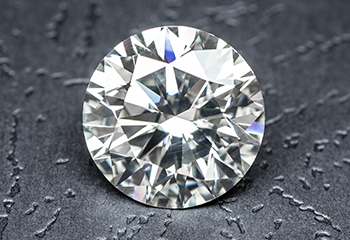 Size is another distinguishing characteristic among moissanite that impact price similar to diamond carat, but hardness, fire dispersion and brilliance tend to remain the same across the board. Your tastes and style preferences and your loved one is unique, so your engagement ring should be, too. Through SunDiamond, you can navigate all these choices in real time, selecting your preferred main stone, customizing the ring style with your preferred metal type, accent diamond quality & more.